Among the stocks covered by Goldman Sachs, the average stock has a one year total return of approximately 10%. We centered our attention this week on the top two percent (return forecast & quality) of our coverage combined with the near term expectations of Goldman. The Muppets are fairly well in consensus with Morningstar and S&P for this batch. Context: The average 1-year total return forecast (via Goldman Sachs) for the Value Line 1700 is 9.2%. The average 5-year return forecast for $VLE is 5.7% (annualized). The Long & Short. (August 26, 2016) Projected Annual Return (PAR): Long term return forecast based on fundamental analysis and five year time horizon. Quality Ranking: Percentile ranking of composite that includes financial strength, earnings stability and relative growth & profitability. VL Low Total Return (VLLTR): Low total return forecast based on 3-5 year price targets via Value Line Investment Survey. Morningstar P/FV: Ratio of current price to fundamentally-based fair value via www.morningstar.com S&P P/FV: Current price-to-fair value ratio via Standard & Poor’s. 1-Year ACE Outlook: Total return forecast based on analyst consensus estimates for 1-year target price combined with current yield. The data is ranked (descending order) based on this criterion. 1-Year S&P Outlook: 1-year total return forecast based on S&P 1-year price target. 1-Yr GS: 1-year total return forecast based on most recent price target issued by Goldman Sachs. The return for the Weekend Warrior tracking portfolio is 12.1% since inception. 48.2% of selections have outperformed the Wilshire 5000 since original selection. The biblical story of David vs. Goliath is fairly widely known. Many would consider it among their favorite stories as a child. After declining the king’s body plate and armor, shepherd David proceeds to a stream and selects five smooth stones. Why five? Well, first and foremost, that was his divine guidance. But another potential driver is not as well known (and sometimes disputed.) Answer: Goliath had four brothers. Form your own conclusions. We prefer to think of this as extreme planning. And in days when market predators seem to ravage our flocks of stocks with abandon, it’s comforting to think about longer perspectives and five smooth stones with masterful sling shot prowess. Bear markets, even gigantic ones, are brought to their knees with the right perspective. With Tin Cup sinking below $900,000 after our recent million-dollar moment, we’re reminded — starkly — that “Stock prices fluctuate.” Should we have increased cash equivalents for Tin Cup based on some elusive indicator during the first quarter? No. As a policy measure, Tin Cup is committed to remaining fully invested in equities 100% of the time. This necessarily means that we’ll endure roller coasters. In the aftermath of a month like May 2012, many investors within this community long for the messages delivered by the late Louis Rukeyser. 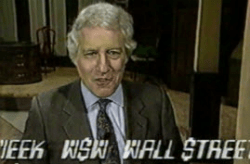 Lou’s steady and calming Wall Street Week (WSW) messages were a staple several years ago on PBS. Hugh McManus shared a number of YouTube rebroadcasts of these messages. Among our favorites include the October 1987 show where Mr. Rukeyser reminded investors worldwide to stay focused on what really matters — family, friends — and discouraged any thought of kicking the family dog or dining room furniture. We happen to believe that high-quality excellent companies purchased/accumulated with elevated return forecasts means that the roller coasters will be of the kinder, gentler variety … but some turbulence is unavoidable. (1) The saying isn’t true. (2) It isn’t the definition of insanity, instability or even pimples. (3) It could actually be harmful advice. (4) It contradicts the notions of experiment and practice. (5) It does not make up for being harmful and wrong by being particularly funny. (6) It is not documented to have originated from either Franklin or Einstein. On these pages a little over a year ago (March 2011) Hugh McManus shared some thoughts on fear, primal instincts and linked his conclusions to Star Trek. That’s right. Hugh urged us to invest like Spock not like Captain Kirk. Fear is powerful and can trigger emotions that cloud our long-term judgment. Hugh admitted during a recent discussion that he actually hoped for a sluggish stock market — some would say “lost decade”, starting in approximately 2000. Is there method to his madness? Absolutely. But you have to account for his age and position on the spectrum of peak-compensation years, etc. In his view, the last several years have been an opportunity to accumulate stocks like Solomon Select feature Walgreen (WAG) at multi-year low prices. Our discussion rekindled memories and thoughts of the 1970s and the stocks featured by Better Investing magazine during the teeth of the oil embargo and misery index days. Some of the best-performing stocks were chosen during those dark days — a reality that we’ve not fully capitalized on. 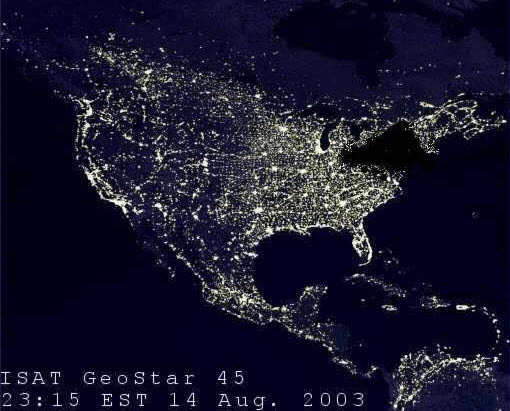 Are the present conditions and doldrums an opportunity for history to repeat? As a case in point, The Limited (LTD) was selected by Better Investing in 1982 just in time for the secular bull market. The story was solid — centered on the steadily increasing number of women in workplace and apparel market drivers. The Limited has been one of the absolute best performing stocks over the last several decades, delivering 17% (+7.3% relative return) from 1982-2012. Hugh does an excellent job of separating emotion from investing and sticks to excellent companies or special situations with long-term merit. He’ll sometimes dabble with a turnaround or emerging company if he perceives opportunity and effective leadership. His perspective extends from at least five years to decades. Long-Term Performance Profiling. 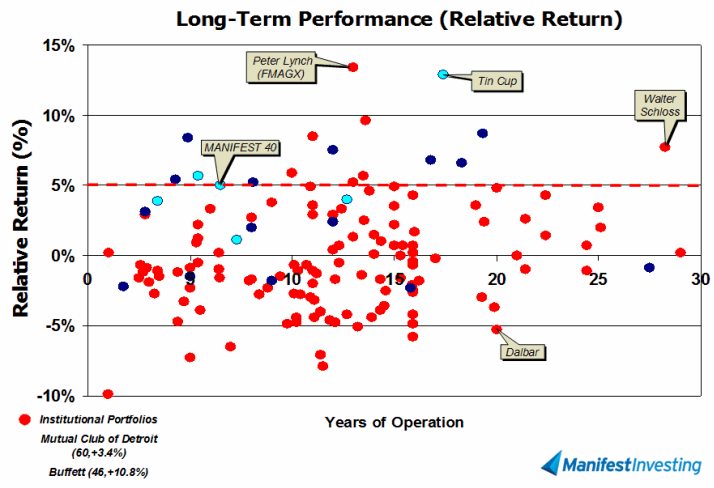 Mapping the relative return results of a variety of club-based portfolios (dark blue dots) and MANIFEST portfolios (light blue) versus a relatively random sampling of institutional portfolios (red dots) presents a compelling story. From Peter Lynch’s Magellan track record at the top to DALBAR’s recent findings of -5.3% relative returns experienced by “average investors” from 1991-2010, the influences are intriguing. We really do believe that groups of investors who heed the lessons of Nicholson, Babson & Graham have at least one leg up on the crowd. We believe that the analysis techniques and portfolio design & management methods of the modern investment club movement offer significant potential. Refer to the accompanying graphic of group averages. 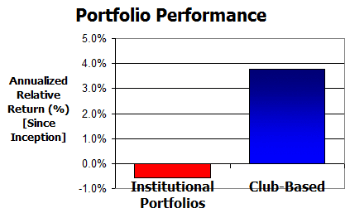 Although we should consider the preliminary results to be a work-in-progress, similar to a small percentage of “precincts reporting”, the average results of the club-influenced portfolios are outperforming their institutional counterparts. We should note that — if anything — there’s a positive bias for the rhino funds, because we included the most successful and widely-held in our early sampling efforts. We know the drill. Invest regularly in high-quality companies when they’re on sale. Prudently diversify. It’s a little like going to battle armed with five carefully selected smooth stones and a steadfast long-term perspective. Sling at will. Invest long and prosper. Our Fave Five essentially represents a listing of stocks with favorable short term total return forecasts (1 year, according to Analyst Consensus Estimates, or ACE) combined with strong long-term return forecasts and good/excellent quality rankings. This week’s batch is a nod to Cy Lynch and Anne Manning who prefer considerable financial strength when return forecasts ebb lower. We also required top quintile EPS Stability — for dividend lovers, a bedrock of EPS is the source of dividends (along with the company check book.) Some of these are flying at lower altitudes — an acceptable condition for core positions but Morningstar believes all five have the potential to outperform the market over the long term. Context: The average 1-year total return forecast (via ACE) for the Value Line 1700 is 14.2%. The average 5-year return forecast for $VLE is 6.6% (annualized). The Long & Short. (August 19, 2016) Projected Annual Return (PAR): Long term return forecast based on fundamental analysis and five year time horizon. Quality Ranking: Percentile ranking of composite that includes financial strength, earnings stability and relative growth & profitability. VL Low Total Return (VLLTR): Low total return forecast based on 3-5 year price targets via Value Line Investment Survey. Morningstar P/FV: Ratio of current price to fundamentally-based fair value via www.morningstar.com S&P P/FV: Current price-to-fair value ratio via Standard & Poor’s. 1-Year ACE Outlook: Total return forecast based on analyst consensus estimates for 1-year target price combined with current yield. The data is ranked (descending order) based on this criterion. 1-Year S&P Outlook: 1-year total return forecast based on S&P 1-year price target. 1-Yr GS: 1-year total return forecast based on most recent price target issued by Goldman Sachs. The return for the Weekend Warrior tracking portfolio is 11.6% since inception. 43.2% of selections have outperformed the Wilshire 5000 since original selection. Context: The average 1-year total return forecast (via ACE) for the Value Line 1700 is 18.3%. The average 5-year return forecast for $VLE is 5.6% (annualized). The Long & Short. (August 12, 2016) Projected Annual Return (PAR): Long term return forecast based on fundamental analysis and five year time horizon. Quality Ranking: Percentile ranking of composite that includes financial strength, earnings stability and relative growth & profitability. VL Low Total Return (VLLTR): Low total return forecast based on 3-5 year price targets via Value Line Investment Survey. Morningstar P/FV: Ratio of current price to fundamentally-based fair value via www.morningstar.com S&P P/FV: Current price-to-fair value ratio via Standard & Poor’s. 1-Year ACE Outlook: Total return forecast based on analyst consensus estimates for 1-year target price combined with current yield. The data is ranked (descending order) based on this criterion. 1-Year S&P Outlook: 1-year total return forecast based on S&P 1-year price target. 1-Yr GS: 1-year total return forecast based on most recent price target issued by Goldman Sachs. The relative return for the Weekend Warrior tracking portfolio is +4.3% since inception. 47.2% of selections have outperformed the Wilshire 5000 since original selection. We took a different tack this week, focusing on companies with HUGE financial strength and combining those leaders with the best 1-year “sentiment” known as target prices. This week’s companies are: Alphabet (GOOG), Cognizant Technology (CTSH), Disney (DIS), Novartis (NVS) and Starbucks (SBUX). Context: The average 1-year total return forecast (via ACE) for the Value Line 1700 is 15.7%. The average 5-year return forecast for $VLE is 5.9% (annualized). The Long & Short. (August 5, 2016) Projected Annual Return (PAR): Long term return forecast based on fundamental analysis and five year time horizon. Quality Ranking: Percentile ranking of composite that includes financial strength, earnings stability and relative growth & profitability. VL Low Total Return (VLLTR): Low total return forecast based on 3-5 year price targets via Value Line Investment Survey. Morningstar P/FV: Ratio of current price to fundamentally-based fair value via www.morningstar.com S&P P/FV: Current price-to-fair value ratio via Standard & Poor’s. 1-Year ACE Outlook: Total return forecast based on analyst consensus estimates for 1-year target price combined with current yield. The data is ranked (descending order) based on this criterion. 1-Year S&P Outlook: 1-year total return forecast based on S&P 1-year price target. 1-Yr GS: 1-year total return forecast based on most recent price target issued by Goldman Sachs.